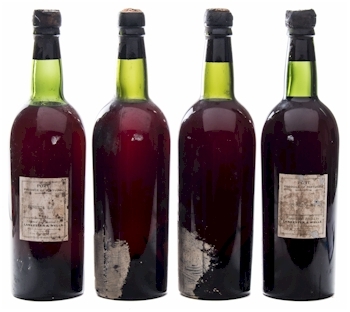 Port was traditionally a sweet dessert wine made in the Duro valley in Portugal, but was used by the English in the 17th century as a way of avoiding tax on French wines. By adding around 17% brandy to the fermentation process, the alcohol content was raised to the desired levels. English Port houses like Taylor's, Warre's and Dow's can buy wine from any regions to make port. Portuguese Port houses are restricted to using the grapes they grow using higher grade grapes for their own port and selling the lower grades to foreign port houses. Madeira is a fortified wine from the Ilse of Madeira in the mid-Atlantic, often a stopping point for early ships in the 17th century. The wine goes through a similar process to Port but is also heated during the process. It was noted on the long journey aboard ship in the 17th century that the heat on the voyage affected the wine and improved the taste, hence the modern process of heating Madeira.